Carousel ads are a kind of advertising format that combines multiple videos or images into a single ad. Carousel ads are most popular on Instagram and Facebook, where you can showcase a number of images to improve your chances of a conversion or sale. Because carousel ads are visually appealing and interactive, they’re a very engaging way to promote a business. According to some studies, this ad format can drive up to 10 times more traffic to advertiser websites than standard sponsored posts on Facebook or Instagram. Additionally, carousel ads also promote a 72% higher click-through rate. How do companies use carousel ads? Carousel ads are a useful marketing strategy for virtually any business or industry. However, some sectors will see greater benefits with a visual ad format. For instance, apparel, retail, beauty and fitness brands are often highly successful with carousel ads. To create a carousel ad on Facebook, the first step a user needs to take is to click into the Ads Manager and choose the purpose or objective of their campaign. Once you’ve picked the reason for your campaign, select the audience that you want to target with your ad. When it comes to choosing the Format of your ad, select the Carousel option. 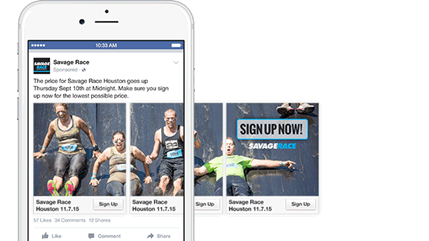 You’ll then be able to view a preview of your ad based on the kind of carousel you’ve chosen. Here, you can experiment with the text and images of your ad. Promote engagement: Visual, moving carousel ads are more likely to capture the attention of your target audience and encourage them to act. They’re more appealing than a standard photo. Are interactive: Even if your customers just click through your carousel to see more of your photos, they’re still interacting with your brand and improving their knowledge of your products and services. Are cost-effective: Carousel ads, like any other social media advertisements, are targeted to reach your specific audience. This means that you waste less of your money targeting people who aren’t going to respond to your content.